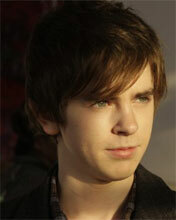 A&E has revealed that Freddie Highmore will play Norman Bates in its forthcoming 2013 series Bates Motel, reports TV Guide. He’ll join Vera Farmiga who was previously cast as Norma “Mother” Bates. The series gives viewers an intimate understanding of how Norman Bates’ psyche developed from his childhood through his teen years. Fans will have access to the dark, twisted backstory and learn first hand how his mother, Norma, and her love damaged Norman, helped forge the most well-known serial killing motel owner in history. Highmore also starred in Tim Burton’s Charlie and the Chocolate Factory. You can check out early teaser artwork for the show here and read up on what we exclusively know about the series right here.